Drought is a subtle, insidious natural hazard that is a normal part of the climate of virtually all regions of the world. Its occurrence results in a myriad of economic, social, and environmental impacts in developed as well as developing nations, although the characteristics of its impacts differ considerably between the two settings. Drought is considered by many to be the most complex but least understood of all natural hazards, affecting more people than any other. It is a normal feature of climate and its recurrence is inevitable. However, there remains much confusion about its characteristics. It is precisely this confusion that explains, to some extent, the lack of emphasis on proactive drought management efforts in most parts of the world. Through an improved understanding of the inevitability and characteristics of drought, as well as its differences from other natural hazards, scientists, policymakers, and the public will be better equipped to establish much-needed policies and plans whereby future vulnerability to drought can be reduced. 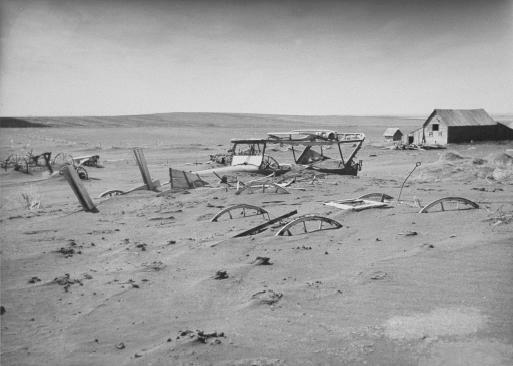 During the Dust Bowl of the 1930s, nearly two-thirds of the U.S. land area experienced severe to extreme drought conditions. This ruined farm is buried under layers of dirt and sand blown across the landscape. drought are nonstructural and typically are spread over a larger geographical area than are damages resulting from other natural hazards. These characteristics of drought have hindered the development of accurate, reliable, and timely estimates of severity and impacts and, ultimately, the formulation of effective drought preparedness plans. Drought results from a deficiency of precipitation from statistically normal (long-term average) amounts that, when extended over a season or especially over a longer period of time, is insufficient to meet the demands of human activities. All types of drought originate from a deficiency of precipitation that results in water shortages for some activity (such as crop production) or for some group (such as farmers). The incidence of drought in the United States during the period from 1895 to early 2002 is shown in the figure on page 262. Droughts differ from one another in three essential characteristics: intensity, duration, and spatial coverage. Moreover, many disciplinary perspectives of drought exist. Because of these numerous and diverse disciplinary views, considerable confusion often exists over exactly what constitutes a drought. Regardless of such disparate views, the overriding feature of drought is its negative impacts on people and the environment. 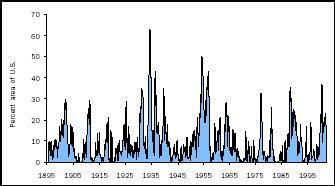 This graph shows the percent area of the United States in severe and extreme drought during the twentieth century. Drought is normally grouped by type: meteorological, hydrological, agricultural, and socioeconomic. The impacts associated with drought usually take 3 months or more to develop, but this time period can vary considerably, depending on the timing of the initiation of the precipitation deficiency. Meteorological drought is expressed solely on the basis of the degree of dryness in comparison to some normal or average amount and the duration of the dry period. Thus, intensity and duration are the key characteristics of this type of drought. Agriculture is usually the first economic sector to be affected by drought because soil moisture content is often quickly depleted, especially if the period of moisture deficiency is associated with high temperatures and windy conditions. Agricultural drought links various characteristics of meteorological drought to agricultural impacts, focusing on precipitation shortages, differences between actual and potential evapotranspiration , and soil water deficits. A thorough definition of agricultural drought should account for the variable susceptibility of crops at different stages of development. Hydrological droughts are associated with the effects of periods of precipitation shortfall on surface or subsurface water supply (for example, streamflow, reservoir and lake levels, and groundwater ) rather than with precipitation shortfalls. Hydrological droughts usually lag the occurrence of meteorological and agricultural droughts because more time elapses before precipitation deficiencies are detected in reservoirs, groundwater, and other components of the hydrologic system. As a result, impacts of hydrological drought are out of phase with impacts of other drought types. Also, water in hydrological storage systems such as reservoirs, rivers, and groundwater often is used for multiple and competing purposes, further complicating the sequence and quantification of impacts. Water uses affected by drought can include purposes as varied as power generation, flood control, irrigation, drinking water, industry, and recreation. Socioeconomic drought associates the supply and demand of some economic good or service with elements of meteorological, hydrological, and agricultural drought. In socioeconomic drought, deficiencies of precipitation are linked directly to the supply of some commodity or economic good (for example, water, hay, or hydroelectric power). Increases in population can alter substantially the demand for these economic goods over time. The incidence of socioeconomic drought can increase because of a change in the frequency of meteorological drought, a change in societal vulnerability to water shortages, or both. For example, poor land-use practices such as overgrazing can decrease animal carrying capacity and increase soil erosion, which exacerbates the impacts of, and vulnerability to, future droughts. The impacts of drought are diverse and often ripple through the economy. Thus, impacts are often referred to as either direct or indirect. A loss of yield resulting from drought is a direct or first-order impact of drought. However, the consequences of that impact (for example, loss of income, farm foreclosures, and government relief programs) are secondary or even tertiary impacts. The impacts of drought appear to be increasing in both developing and developed countries, which in many cases reflects the persistence of nonsustainable development and population growth. Lessening the impacts of future drought events will require nations to pursue development of drought policies that emphasize a wide range of risk management techniques, including improved monitoring and early warning systems, preparedness plans, and appropriate mitigation actions and programs. The impacts of drought that must be addressed can be classified into one of three principal types: economic, environmental, and social. Economic impacts range from direct losses in the broad agricultural and agriculturally related sectors (including forestry and fishing), to losses in recreation, transportation, banking, and energy sectors. Other economic impacts would include added unemployment and loss of revenue to local, state, and federal government. Environmental losses include damages to plant and animal species, wildlife habitat, and air and water quality; forest and range fires; degradation of landscape quality; and soil erosion. These losses are difficult to quantify, but growing public awareness and concern for environmental quality has forced public officials to focus greater attention on them. Social impacts mainly involve public safety, health, conflicts between water users, and inequities in the distribution of impacts and disaster relief programs. As with all natural hazards, the economic impacts of drought are highly variable within and between economic sectors and geographic regions, producing a complex assortment of winners and losers with the occurrence of each disaster. A prolonged drought in the eastern United States in 1999 lowered the water level of the Lehigh River approximately 5 feet. 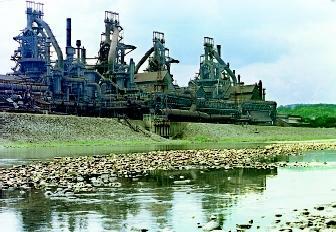 The much-reduced flow affected municipal and industrial uses along the river, including the Bethlehem Steel Plant (background). both components if they are to make progress in reducing the risks associated with drought for future generations. These factors change over time and thus vulnerability is likely to increase or decrease in response to these changes. Subsequent droughts in the same region will have different effects, even if they are identical in intensity, duration, and spatial characteristics, because societal characteristics will have changed. However, much can be done to lessen societal vulnerability to drought through the development of preparedness plans that emphasize risk management and the adoption of appropriate mitigation actions and programs. Many of the management alternatives available to water suppliers to prepare for and respond to drought events fall into two broad categories: demand management and supply augmentation. In summary, increased emphasis can and should be placed on drought mitigation and preparedness, as well as prediction and early warning capabilities, if society is to reduce the economic and environmental damages associated with drought and its personal hardships. This will require interdisciplinary cooperation and a collaborative effort with policymakers at all levels. SEE ALSO Agriculture and Water ; Conservation, Water ; Demand Management ; Supply Development . Riebsame, William E., Stanley A. Changnon Jr., and Thomas R. Karl. Drought and Natural Resources Management in the United States: Impacts and Implications of the 1987–89 Drought. Boulder, CO: Westview Press, 1991. Wilhite, Donald A., ed. Drought: A Global Assessment (Volumes 1 and 2). London, U.K.:Routledge, 2000. Wilhite, Donald A., and Michael H. Glantz. "Understanding the Drought Phenomenon: The Role of Definitions." Water International 10 (1985):111–120. Wilhite, Donald A., and Olga Vanyarkho. "Drought: Pervasive Impacts of a Creeping Phenomenon," (Chapter 18). In Drought: A Global Assessment, ed. Donald A. Wilhite. London, U.K.: Routledge, 2000. Wilhite, Donald A. et al. "Planning for Drought: Moving from Crisis to Risk Management." Journal of American Water Resources Association 36 (2000):697–710. Because of the number of affected groups and sectors associated with drought, its spatial extent, and the difficulties connected with quantifying environmental damages and personal hardships, the accurate determination of the financial costs of drought is an arduous task. It has been estimated that the average annual impacts of drought in the United States are between $6 and $8 billion. However, during the drought years of 1976 to 1977 and 1988, government estimates of impacts were $36 billion and $40 billion, respectively.